Like many of you, I played through the Fuse demo when it went live a few weeks ago. I was unimpressed with the game as a solo experience, but it grew on me once I played through the available section of the story mode with a co-op partner. Insomniac did themselves a disservice with that demo. Sure, the campaign is fun, but Fuse’s bread is buttered in the superior Echelon mode. 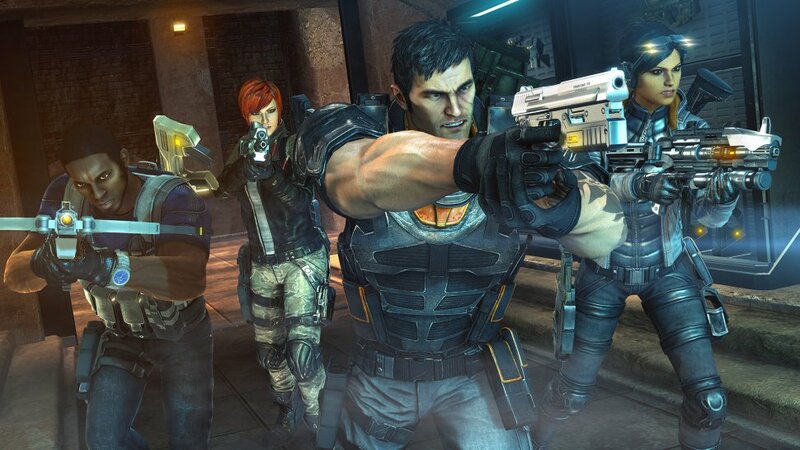 This co-op shooter should not to be missed. The premise is simple: A four person squad of elite soldiers, dubbed Overstrike 9, embarks on a less-than-routine mission when they stumble upon some top secret super weapons cooked up by a clandestine organization. These weapons are enhanced with an alien energy source called, you guessed it, “Fuse.” Another secret organization, we’ll call them “The Bad Guys,” breaks into the facility because they want to get their hands on a sweet “inFused” MacGuffin. The Overstrike 9 team didn’t get these fancy guns for nothing. It’s time to kill some bad guys. The story, locales, and characters are perfectly serviceable, but there’s not much here you haven’t seen or heard before. I did enjoy the music, as it has this droning sense of purpose and doom at times, offering a nice contrast to the lack of urgency of our heroes. The game looks nice enough, and each character has a little attitude, but Insomniac doesn’t take the necessary time in the campaign to flesh out anyone as more than a wise-cracking hero or a megalomaniacal villain. The overall story feels incomplete -of course, that’s what you do when you’re trying to launch a franchise, but even for an “episode one,” this seems rather truncated. Luckily for Insomniac (and us) the stellar gameplay of Fuse stands on its own. I began the campaign as Izzy, because I have a thing for intelligent women and encasing my enemies in melanite. My co-op partner took control of Naya, because she likes stealthy cloaking powers and the ability to crush men into a singularity. Fuse offers local co-op via a vertical split screen display. It also supports four player online co-op and combo co-op. Huzzah! The split screen HUD was a little crowded with the fade away ammo and level indicators, but it was manageable. We played through the first stage, using pedestrian pistols and taking advantage of an intuitive cover system which allowed for vaulting, cornering, sprinting and sliding behind barriers. I should note that all three times we played the first mission we ran into the same camera-breaking bug. I resolved the issue by resetting the checkpoint twice and using the “Leap” feature once. It may be patched out of existence by the time you get your hands on the game. Either way, it was a quick fix and the only real technical issue I had with the title. After the characters got their “What were they working on?” lines out of the way we procured our Fuse weapons. That’s when the game took off. The ensuing firefights were fierce and brutal. Melee takedowns, whether initiated stealthily or in the heat of battle, were violent and satisfying. Enemy soldiers sniped, flanked, and used grenades to great effect. There were a variety of baddies, from standard grunts, to jetpacking shotgunners, to fully armored soldiers operating artillery-wielding mech-like suits. Relying on standard firearms was a death sentence. That’s where the Fuse-powered Xenotech weapons steal the show. All four characters have their own unique Fuse weapons and abilities. Dalton has an enemy squishing Magshield. Jacob wields a scoped Arcshot for sniping. Naya carries a Warp Rifle which can implode enemies. Izzy is armed with a Shattergun which can grotesquely freeze soldiers in place. Each character will earn an incredibly useful secondary ability early in the game. These little extras, like a stand alone shield, cloaking, and an AoE health beacon, make the more furious firefights (and all of the Echelon maps) possible. The most important thing to realize is that nearly all the special weapons and abilities are based on cooperative play. Dalton’s Magshield provides mobile cover for teammates. Naya can infiltrate enemy lines using her cloaking abilities, allowing her to not only flank fire positions, but to tag crowds with her Warp Rifle before sucking her foes into oblivion. Jacob can lay traps with his Arcshot and do massive damage to armored targets. Izzy’s enemy stopping Shattergun is great for crowd control. When we used our abilities together, like warping away enemies who had already been frozen with a Shattershot, we were rewarded with XP bonuses. More XP netted us more skills which allowed us to kill more bad guys with greater ease. And isn’t that what it’s really all about? Fuse supplied us with two AI partners since we didn’t have a full roster of living, breathing, players. The AI ranges from impressively badass to shockingly inept. Once we had leveled up our AI characters appropriately (they gain XP as well, but at a slower rate than player controlled characters) they would use their special abilities, call out targets, and most importantly, revive fallen players. Our AI-controlled Dalton would occasionally drop a Magshield in an insaniating (it’s like infuriating, but it slowly drives you insane) location. Luckily, savvy players can take over for friendly AI using the Leap feature. Page created in 0.3951 seconds.